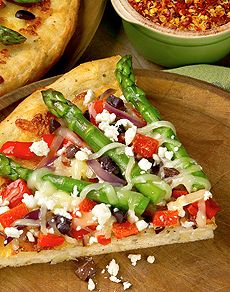 For a vegetarian twist on Supreme Pizza, try this Asparagus Pizza With Red Bell Pepper, Olive & Feta Cheese. Photo courtesy California Asparagus Commission. Asparagus on a pizza? Of course—it’s no different from adding green bell peppers or broccoli to your slice. And it looks so much more artistic! This is Page 4 of a 12-page article. Click the black links below to view the other pages. Jump to the recipe below. On the dough shell, layer in order red bell pepper, onion and olive. Arrange asparagus spears over vegetables, tips toward the edge, in a pinwheel fashion. Evenly sprinkle with cheeses. Bake in preheated oven until crust and cheese are lightly browned, about 10 minutes.